This was one of my most popular articles in SERVO magazine. The project covers how to emulate an old SC-01 speech chip using a more modern speech chip and a microcontroller as a translator. The end result is a plug in replacement that acts like the original. There were many challenges that were overcome to make this project. For every roadblock there ended up being a way around it and all of those are discussed in the article. Some of the challenges in replacing the SC-01 with a SpeakJet is that they have a different footprint, they have different voltage levels, they have different handshaking signals, one has a parallel interface while the other has a serial interface, and finally the speech codes are different. The prototype was built using a Parallax SX28 Protoboard and a SpeakJet speech IC. Eventually the whole thing could be shrunk down to fit on a small hybrid DIP module as a direct replacement for the original SC-01 chip. After talking with SERVO magazine they have given me their blessing to post a copy of the actual article as presented in the December 2007 issue of SERVO. It is available here as a PDF for personal use only and is not to be uploaded to other websites or incorporated into any commercial projects. This article should help any HERO owners out there understand their robots better and also get them going again. 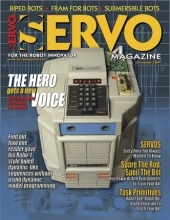 SERVO articles for November 2007 and December 2007 online! New Website for the Robot Workshop!